Nice 12 inch by these cool dudes. 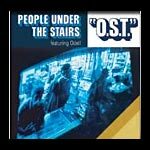 All songs produced by People Under The Stairs. Scratching on all songs by Double K. Featuring Odel.